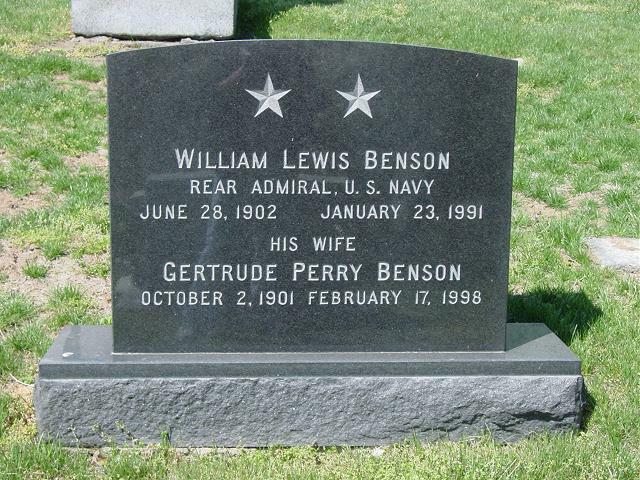 Retired Navy Rear Admiral William Lewis Benson, 89, a former math teacher and decorated war veteran, died January 23, 1991 at his home in Alexandria, Virginia, after a long illness. A native of Vittsjo, Sweden, he came to the US as an infant with his family, which settled in Kingston, New York. He graduated from the United States Naval Academy in 1925 with a bachelor's degree in engineering. He received a master's in education from George Washington University in the late 1950s. Most of his Navy career was spent in cruisers and destroyers. He was twice awarded the Legion of Merit during World War II. He was also awarded French Croix de Guerre for his actions during the invasion of Normandy. After graduating from the Navy War College in 1938, was assigned to duty in the War Plans Division of the Chief of Naval Operations in Washington, DC. He was serving as engineer officer of battleship Oklahoma during the attack on Pearl Harbor and was commended for directing the rescue of 32 members of the crew who were trapped in the hull when the ship capsized. During the war, served aboard the cruiser Brooklyn and was commended for his part in the rescue of 1,173 survivors of the transport Wakefield, which burned at sea. In 1943, was promoted to the rank of Commander and became an aide to the Chairman of the Joint Chiefs of Staff. He became a Captain in 1944 and commanded a task group that escorted 17 convoys across the Atlantic. After his 1955 retirement from active duty as Commander of the Navy Station in Green Cove Springs, Florida, he taught math at public and private schools here for 15 years, including Wakefield High School, Congressional and the Bullis Preparatory schools. He is survived by his wife of 56 years, Gertrude Douglas Perry Benson; two sons, retired Army Major William Lewis Benson Jr, of Huntsville, Alabama, and retired Navy Captain Perry Southall Benson of Panama City, Florida; two grandsons; and a great-grandson. Services will be at the Fort Myer Chapel, with burial in Arlington National Cemetery. The family suggests that expressions of sympathy be in form of contributions to USNA Alumni Assn or the American Cancer Society. June 28, 1902-January 23, 1991. The Admiral is buried in Section 2 of Arlington National Cemetery.